Whether the OPC Data Acquisition is continuous or time-controlled (see here for details), once started, it can be stopped at any time. Note that the icons 'OPC Data Listing' and 'OPC Data Charting' are enabled as OPC data are available. 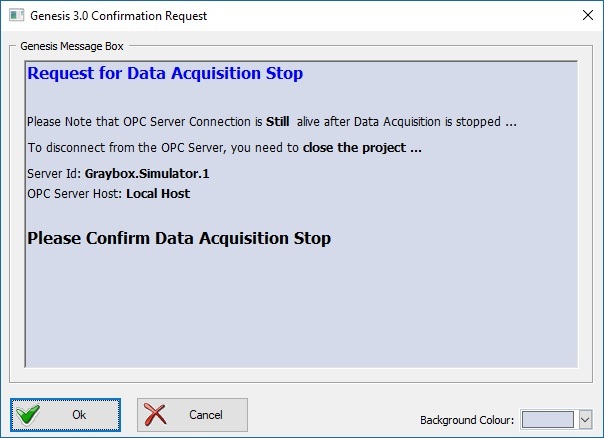 Note that the OPC Data Acquisition is stopped but not Closed... It means that the Data Acquisition can be resumed at any time (see here for details) This is visually displayed in the View Ribbon, the Button 'Resume Data Acquisition' being enabled.